Acute or chronic back-ache, such as slipped spinal discs, spinal wear-and-tear, and post-operational spinal healing, have a negative impact on the quality of life. Shoulder pain can affect your life in an equally unpleasant way. With CT -guided (computerized tomography) pain therapy I am able to offer you a highly effective and gentle treatment method in the diagnostic centre in Meidling, which is the most appropriate kind of pain therapy for the spinal column (slipped spinal discs, spinal disc protrusions, wear-and-tear of minor vertebral joints) and shoulder arthritis. What happens during CT-pain therapy? 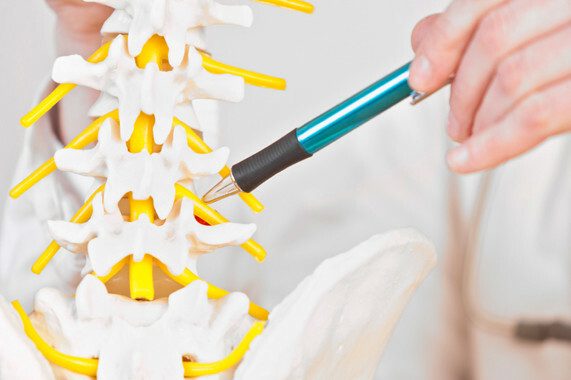 With computerized tomography it is possible to obtain an exact localisation of the origin of the pain in the spinal column or the joint. For the treatment you either lie simply on your stomach or back in the computerized tomography scanner. Once the exact point of entry has been determined, the skin is disinfected, after which a mixture of drugs consisting of a local anaesthetic and a cortisone preparation is injected with a fine hypodermic needle. 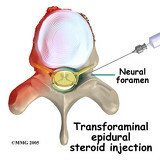 The advantage of the use of computerized tomography is that it enables the exact placement of the injection with millimetre precision. As the drugs that inhibit inflammation take effect exactly at the point at which the damaged nerves or spinal joints are located, the body is clearly burdened to a lesser extent compared to other treatment methods (taking pills or infusions). A small amount of contrasting agent that contains iodine is required to visualise the correct distribution of drugs to guarantee an exact positioning. The treatment does not take long, but if deemed necessary a brief observation period in my practice might be necessary following the procedure. As the local anaesthetic can inhibit your response time while driving, please have someone pick you up or accompany you on your trip home. 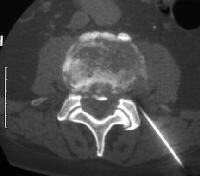 For whom is CT-pain therapy appropriate? CT-pain therapy suits all patients who desire an effective method that is also gentle. CT-pain therapy is not suitable for pregnant women and mothers who are breast-feeding. Should you be taking blood thinners such as Aspirin, Sintrom or Marcoumar, a prior consultation is necessary. Please note that this service is not generally covered by public medical insurance.